Sesbania Punecea is an ornamental shrub that produces reddish orange flowers,has deciduous leaves and grows to 15 feer high.This plant has a high demand for water,and thrives in swamps or high-moisture areas.It also requires a mildly acidic soil to grow in ,ranging between 6.1~6.5pH. The genus name Sesbania is a latinised version of the old name “Sesban” of Arabic origin. Sesbania is a legume also known as a “Swamp Pea”. It is great for duck marshes and quail. Sesbania makes a good cover for ducks and upland game birds, growing as high as 8-12 feet. It is one of the finest quality quail foods available. Dove and wild turkey also have a craving for Sesbania. Grows best in moist, heavy lands though will grow im most soils. Sesbania, Cowpea, or Crotalaria juncea can follow crops such as early sweet corn and early processing tomatoes, and precede fall-planted crops such as vegetable brassicas and cereal grains (Miller et al., 1989). According to Duke (1981), sesbania has been used as a warm-season cover crop in citrus from Florida to southern California, and on irrigated lands is sometimes used in rotation with vegetable crops. The Yuma Indians use the plant to produce a strong, lustrous fiber for making nets and fishing lines. Sesbania is sometimes used for wildlife enhancement in southern Georgia. Plantings along orchard borders may do double duty by providing habitat to game birds and predatory insects (Bugg and Dutcher, 1989). As a drought-intolerant species, it might be suitable as a summer cover crop in moist, low-lying (pecan) groves or in orchards with solid-set irrigation (Bugg et al., 1991). When sesbania is used as a green manure, its roots are said to open up subsoil (McLeod, 1982). Sesbania can be sown in mixtures with browntop millet, proso or hog millet, and beggarweed to provide quail food (Duke, 1981). Sesbania i.e. swamp seeds. This is very attractive species and is found growing wild mainly in southern half of Alabama. The plant is cultivated else where. This is a shrub to small tree which reaches a height of +2m. Plant grows easily from seed and makes a fantastic garden specimen. It is easily identified by its bright red flowers and 4-winged fruits.The genus name Sesbania is a latinised version of the old name “Sesban” of Arabic origin. In India seeds are sown in June-July at onset of southwest monsoon; sowings after September produce poor seed production. In southern United States seed broadcast after soil has been moistened by rains in April or May and harrowed. In India seed is usually broadcast, but sometimes drilled in rows of 30cm apart. Thicker planting facilities harvest of small plants. The crop is fast growing and needs little weeding. Usually, no fertilizers are applied. In India, it is grown as main crop in rice rotation or as a border crop on the edge of rice fields. The seeds get ready to cut in September or October, but the fiber does not suffer it left standing until seed is ripe in November. In India seed matures in about 5-51 / 2 months; in the United States in about 2 months. Ripe pods normally do not suffer. In India pods are usually hand picked and threshed by beating sticks; however, if hand picking is delayed by March, some pods shatter. In the United States crop is harvested by machine and windrowed, and then threshed with an ordinary thresher. Seeds must be treated with insecticides before storing, as they are liable to damage by insects. Process for steeping and cleaning the fiber are similar to those for sunn hemp (crotalaria juncea). 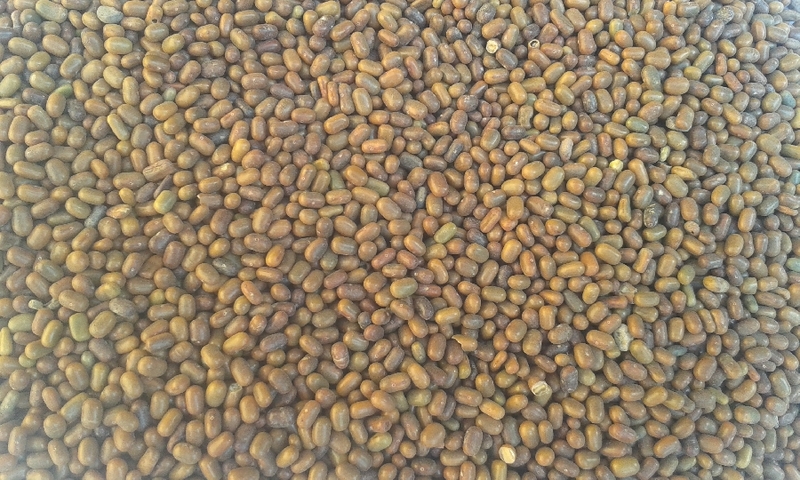 In India yields of seeds are about 600 / kg / ha; in Peru, 900 kg / ha; in California, 1,000 kg / ha. Fiber yields are 100-1000 kg / ha. This crop is self pollinating and requires no isolation for pure seed production. Several nematodes attack this Sesbania: Meloidogyne incognita, M. javanica, and Trichodorus minor. In southern United States, this crop usually precedes autumn planted vegetables. However, because of nematode attack, it is not recommended for growing in sandy soils with other susceptible crops, as cucurbits. Weevils and caterpillars attack seed pods, and the seeds in storage. These may be controlled with insecticides. Plants are attacked by the parasitic flowering plant, Dendrophthoe falcata. It tends to thrive in almost any soil type but prefers very moist, fertile conditions. Sesbania grows rapidly in hot weather and matures in around 90 to 100 days after emergence. Seeds are highly preferred by quail, turkey and doves. Sesbania is a vigorous, very tall annual legume that thrives in warm weather locations. The stalks of this plant reach a height of 8 to 12 feet. Sesbania is valuable as a green manure crop because of its tremendous growth. It can be ready to plow under in 8 to 12 weeks after germination. Sesbania is particularly suited for planting in orchards because it protects the young trees during hot weather, and enriches the soil at the same time. The seed color at maturity is cream colored with a smooth seed coat. The Sesbania pea is classified a non Crowder class and is primarily planted for bird feed and bird feed mixtures when harvested as a professional farm crop.